Insure the engagement ring in case it goes down an unsuspecting drain. Make sure to clarify if your policy covers lost and stolen rings. Put together a tentative guest list and budget so you know which potential venues will suit your needs. Tour some of your top reception and wedding venue choices or decide on a destination for your wedding. Book the venue. Set the date, and start letting family and friends know — especially if travel will be involved. Consult parents, then grandparents, then siblings, then close relatives, and then friends. Start your gift registry at two or more stores (be sure one is brick and mortar), and include items at various price points. Consider hiring a wedding planner or see if your venue provides one, and set up an initial appointment. Start scoping out bridal expos to attend, and check out apps and websites to help you with planning. 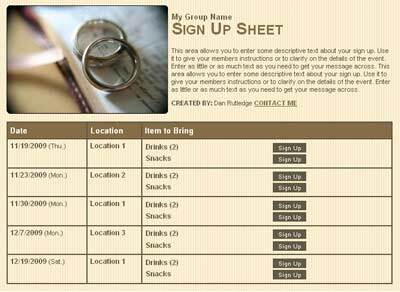 Finalize a guest list and get realistic about how many people you can accommodate and feed within your budget. Ask relatives/friends to be in your wedding party. Special notes or gifts are always appreciated but not required. Research photographers, videographers and entertainment. You are never "too early" to check for availability. This also goes for the officiant for your ceremony. Bands and DJs are often booked a year or more in advance, so do some research and reserve your reception music as early as possible. Decide on a rehearsal dinner venue, menu and guest list. Start searching for decor inspiration, and make a list of what you can do yourself and what will get hired out/bought. Start trying on bridal dresses. Get one early if you know you will want to make drastic alterations. Think through the added personal touches you want at the ceremony or reception. A special video during the ceremony or photo booth for the reception? Start working on these, and enlist help if needed. Research and select bridesmaid dresses so they can be sized properly. Leave plenty of time for alterations. Finalize and book a photographer/videographer. Choose a caterer for your reception. Taste samples and order a cake or other desserts. Research honeymoon sites, book your hotel/accommodations and request all necessary days off work. Book your engagement photo session if you are planning one. Select the groom and groomsmen’s suits, as well as the flower girl and ring bearer attire. Get recommendations and make appointments for hair and makeup if you want this professionally done. Be sure to check the cancellation policy as well. Create a wedding website if you would like to have one. Send out save-the-date cards, especially if it is a destination wedding or over a holiday weekend. This is where you can tell folks about your website. Consider arranging a block of hotels for those coming from out-of-town, and include this information on your website or save-the-date card. Start addressing and stamping the invitations five months before the ceremony. This will give you time to track down any missing or outdated addresses. Schedule the bridal portrait session with your photographer. Research the deadline to submit your wedding announcement to your local newspaper. Buy wedding bands and finalize accessories for the wedding party such as shoes or jewelry. Book a wedding night hotel and finalize honeymoon plans. Update your wedding website with additional details, and add more items to your registry after bridal showers. Genius Tip: 30 bridal shower games for guests. Arrange your transportation between venues for the day of the wedding. If planning a honeymoon out of the country, renew or apply for passports. If you need any vocalists or musicians for your ceremony, arrange those now (allow more time if they are a professionals). Write your wedding announcement and submit to your local newspaper before the deadline. Start working on vows if you will be writing your own. Create a song list for the band or DJ and include songs for your first dance as a couple, father-bride dance and mother-groom dance. To step up your moves for your first dance, take ballroom dancing lessons with your fiancé. Schedule a dress fitting. The same goes for the bridal party if there have been changes. Invite rehearsal dinner guests via card or email with event details. Include hotel and transportation information. Genius Tip: Collect RSVPs with an online sign up. Plan the order of your ceremony with your officiant and design the program if needed. Many churches will create one for you. Ask for any time off work you may need. Depending on your line of work, you may need to do this even earlier. Mail invitations. If travel is involved, send them three months before the ceremony, or save time and money by sending online invitations. Write and mail thank you notes for bridal shower gifts. Buy thank you gifts for the bridal party and parents. Prepare a photo/video shoot checklist for the wedding day with your photographer. Purchase a guest book. Make sure you have enlisted day-of helpers including guest book and gift attendants or program distributors if they are available. Get your license for marriage (usually good for 60 days after it is issued). Prepare any name change documents that will be filed post nuptials. Check in with those who have not replied and enter in RSVPs to a guest-list database. Add a few more things to your registry that are both at the low and high end for last-minute shoppers. Get haircuts, teeth whitening and any other cosmetic procedures done now. Don't wait until the last minute! If family and friends will be giving toasts at the wedding, decide on timing and put someone in charge to coordinate toasts on the big day. Prepare welcome bags for guests staying at hotels with water bottles, snacks and details about the wedding events and local attractions. 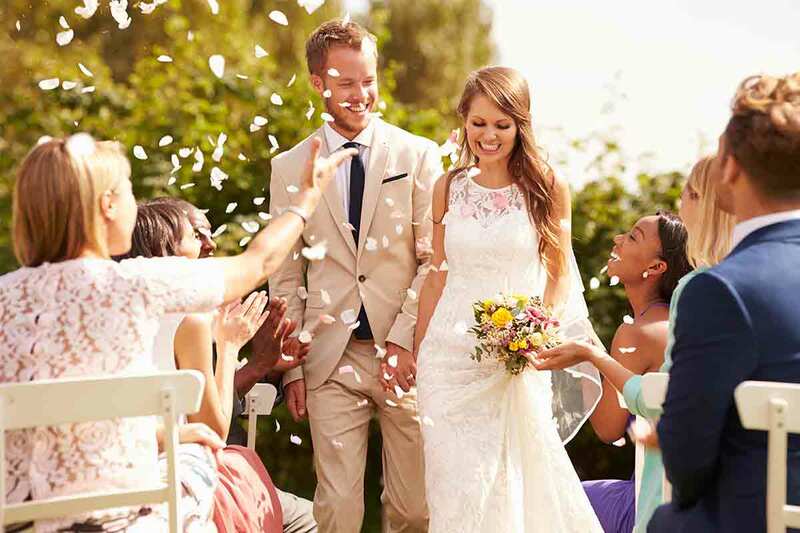 Confirm wedding day details with all vendors and give the caterer a final head count. Finalize your seating chart for the reception. Confirm transportation needs for the big day. Pack for the wedding night and honeymoon trip. Communicate to the wedding party about the wedding day schedule. Clarify any questions or concerns. Revisit your ceremony details, including music, readings and special rituals (candle lightings, etc.). Schedule a run through of hair and makeup. Even if you are doing it yourself, set aside a day to practice. Figure out some "after" logistics. Assign people to help take down any decorations at your wedding venue, ask someone to box up any things you want to save and secure boxes for packing reception/gift items as well. Ask your groom to find a family member or friend to return his tux and other rental items. Pack all cosmetics, shoes (wear them around the house to break them in) and jewelry for the big day. Make a list of "don't forget" items (including the marriage certificate!). Get a manicure/pedicure and pamper yourself. Enjoy a last pre-wedding date with your fiancé. Decorate the venue the day before if possible and confirm any last-minute site details. Show up early for your rehearsal, and clarify any questions with your officiant and wedding party. Give out wedding party gifts at the rehearsal dinner. Thank your parents and those who have helped make your wedding day possible. Pack a few snack items and water bottles for the wedding party to enjoy before the ceremony. Make sure that all the attire is where it needs to be and remind the wedding party what time to arrive. Once the big day arrives, congratulate yourself — you've made it! Just make sure to check off two last details: take a deep breath, and enjoy the day you have spent so much time planning. Cheers to a wonderful wedding! 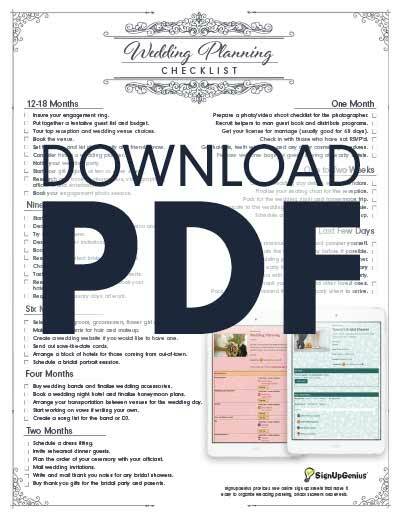 HOW CAN I DOWNLOAD THE PDF FOR THE WEDDING PLANNING CHECKLIST. 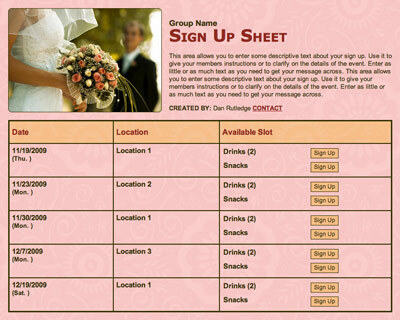 Gather bridal shower RSVPs with an online sign up.